Science is a funny business. Innovative science is autonomous, it rolls under its own steam; and yet science serves humanity, and doesn't intend to roll over anyone. The products of science should be freely available. To this end, I support the GNU Free Documentation License, which is an extended version of the GNU Public License for Open Source software. Excepting links to possibly copyrighted material originating elsewhere, the text and images on my website can be used freely, within the restrictions of this license (for example, they can be incorporated into GNU-licensed free encyclopedias such as Wikipedia). If you have a website yourself, please add a message like this to your own web pages to promote free access to knowledge (see Wikipedia's instructions). Aan alle proeflezers van mijn nieuwe boek Zwaartekracht bestaat niet hartelijk dank! Bij deze de aankondiging van de publicatie. My lectures "It's a Photon World" on the physics and propagation of light in astrophysics are presented here as pdf images and as mp3 recording. Wie belangstelling heeft voor mijn versie van de Socrateslezing voor het Humanistisch Verbond kan hier alle gegevens en opnamen vinden. My activities in the arts have been bundled under the title Alien Art. If you're interested in finding out about the sort of work I do, you may click here. The web site is brand new, and more content will be added soon. The purpose of this course is to provide the student with a basic and robust understanding of the physical processes that govern the structure and evolution of stellar systems such as globular clusters and galaxies. Such systems are definitely not just an application of N-body point mechanics; it will be argued that just about all other astrophysical phenomena play a role in the understanding of large stellar systems. Among these are two- and three-body processes, stellar evolution, tidal effects, and in extreme cases even gravitational radiation. We will discuss stellar dynamics from a theoretical and computational perspective. The dynamics of systems of stars, or other objects that interact gravitationally (dark matter, planets, etc.) are described by Newton's laws of gravity. Exact theoretical analysis generally fails for systems with more than two objects, but for systems with a sufficiently large number of objects new theoretical principles become available. The hardest systems to understand consist of any number of objects between two and 'many'. In this course we start with understanding two objects that orbit each other, to slowly increase the number of objects as we go along. Eventually we focus on approximate approaches to understand the dynamics of stars. 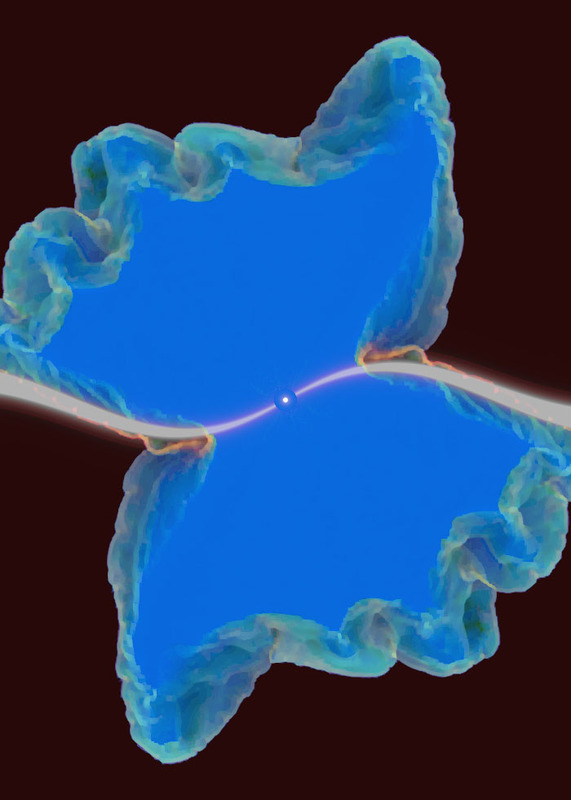 Topics include force calculation techniques, integration of the equations of motion, potential theory; orbits in given potentials; the collisionless and the collisional Boltzmann equation; self-gravitating systems; the Jeans equations; dynamical friction, and dynamics of few body systems. Methods are applicable to a wide range of astrophysical systems, such as the Solar system, triple stars, stellar clusters, galaxies, and clusters of galaxies. The course is aimed at the first-year Master's level. Prerequisites are Classical Mechanics, Ordinary Differential Equations, and a Bachelor's level familiarity with General Astronomy and Stellar Structure and Evolution. It is helpful to have a Bachelor's level knowledge of statistical mechanics and computer programming. Throughout the course, reference will be made to Prof. Simon Portegies Zwart's lectures on Computational Astrophysics. The web site of this course will be updated as necessary. University and Sterrewacht specifications of the course are to be found here. The course provides a review of modern cosmology, with emphasis on the early stages of the Universe, in particular the era in which radiation and matter were strongly coupled. We discuss the homogeneous and isotropic Friedmann models, and briefly consider their observables in the local Universe. This provides the basis of observations in the expanding Universe, and the present-day best guesses of the parameters that govern the expansion. The standard model for the hot Big Bang is subsequently described, including the physical processes in the early Universe, such as inflation, baryogenesis, and nucleosynthesis. Next, a survey is made of the properties of the constituents of the cosmological fluid. These include the various radiation backgrounds, and the visible and dark matter. The properties of the surface of last scattering are discussed, as well as the structure in the local Universe, and the processes that led to its formation. Finally an overview is given of the results of recent observational campaigns that constrain the cosmological parameters. The web site of this course will be updated as necessary. The web site of this course will be updated as the course progresses. The lectures are being given in the 2010 autumn semester. Upon the request of our Masters students, I have taught an extra half-semester course on Computational Dynamics. 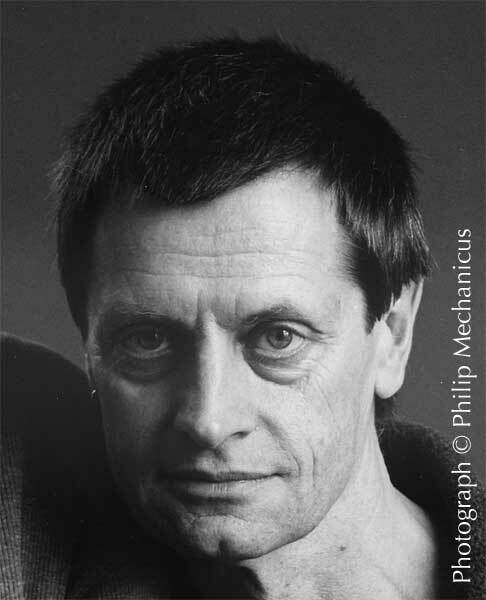 The lectures covered the physics of self-gravitating point masses, corresponding mathematical properties of such systems, astrophysical applications, and practical exercises using an educational version of Simon Portegies Zwart's computer code. Knowledge of classical and statistical mechanics, ordinary differential equations, and some computer programming (preferably C) is a prerequisite. The web site of this course has now been completed. This course was given in conjunction with Dr. Clovis Hopman's course on Stellar Dynamics. 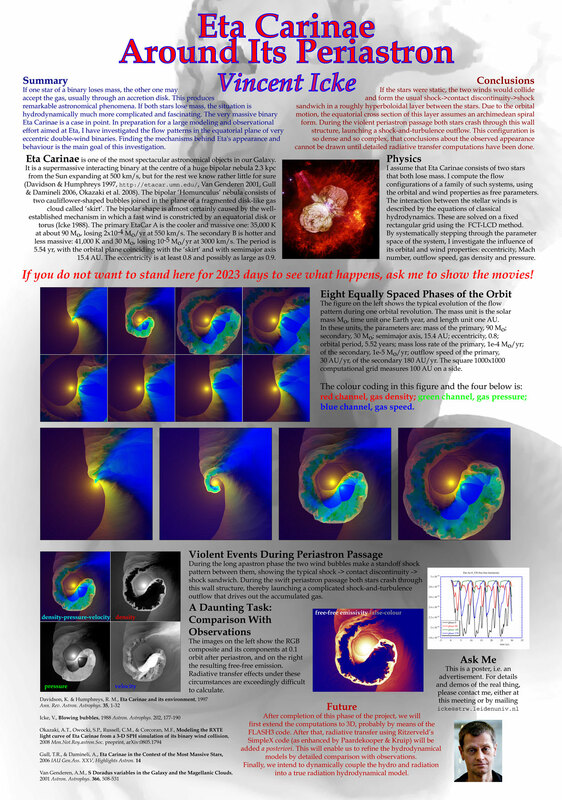 The title of my contribution to the annual Netherlands Astronomers' Conference is Eta Carinae Around Its Periastron. The corresponding poster is here. 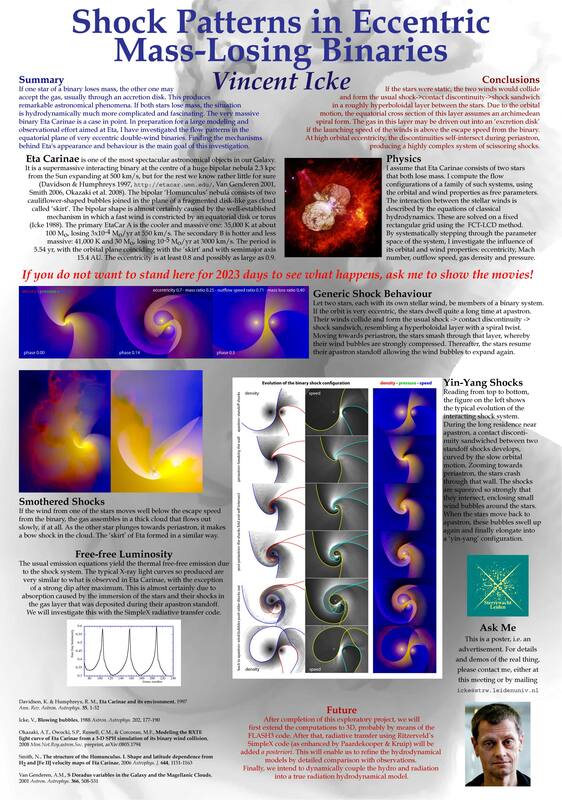 The poster from 2009 was called Shock Patterns in Eccentric Mass-Losing Binaries which can be found here. AAS Meeting 201 A small-screen video version of my paper Blowing Up Non-Planar Disks, presented at AAS Meeting 201 in Seattle (WA, USA), is attached here in QuickTime format. See also the summary of this talk. Pretty picture showing a spiral-wave disk blown up by a central stellar wind. An explanation is on my science page, where you may also find a movie in QuickTime format (10.1 Mb). Beste bezoeker: zoals je zult merken, is het merendeel van deze webstek in het Engels gesteld. Een deel van het materiaal bestemd voor het onderwijs en voor algemeen publiek is in het Nederlands. Ik heb geen tijd & geen zin om een volledig tweetalige webstek bij te houden. If you are looking for a position as a graduate student or postdoc at Sterrewacht Leiden, please consult the current job listings of Sterrewacht Leiden or the NOVA job listings. Many typeset files on my site are given in PDF format. To read these files, you need the Adobe Reader, which is freeware from Adobe Systems, Inc.
Er is een webstek in aanbouw met gegevens over alle Leidse professoren. A website, still under construction, gives particulars about all professors at Universiteit Leiden. Een kort curriculum vitae in het Nederlands vindt u hier. Those who don't read Dutch may click here for a miniature curriculum vitae in English.